Official app of the Museo del Prado. 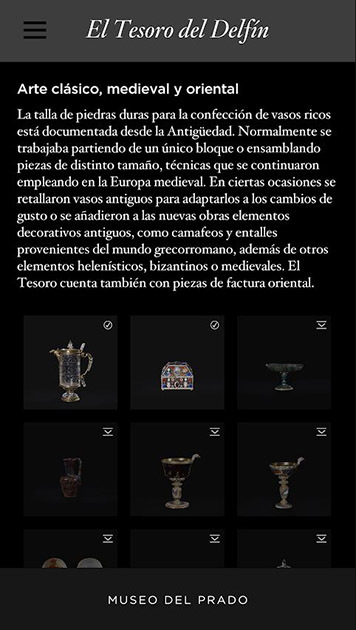 With support from Samsung, a technological sponsor of the Prado, this app is an excellent tool for discovering the Dauphin’s Treasure and enjoying the collection down to the finest detail. Each work is accompanied by its fact sheet, information of interest and the reproduction of its case, where this has been preserved. In addition, the pieces can be enlarged and visualized in 360º by sliding the fingers on the screen of the device, making this a unique experience. 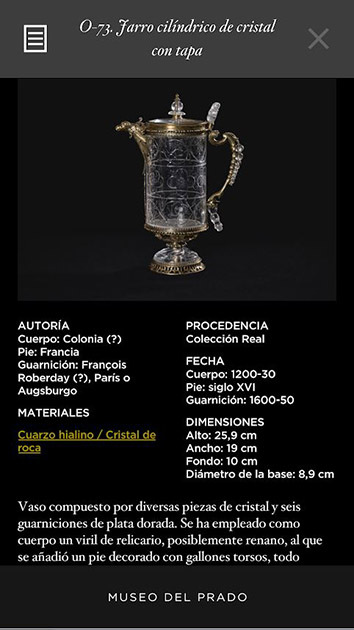 Philip V, the first Spanish Bourbon king and grandson of Louis XIV, inherited an exceptional group of vessels from his father, Louis, the Grand Dauphin of France (1661-1711). Made of rock crystal and decorative stones, traditionally known as “hardstones”, most are embellished with gold and silver mounts and with diamonds, rubies, emeralds, pearls and other gems. This collection is known as the Dauphin’s Treasure. 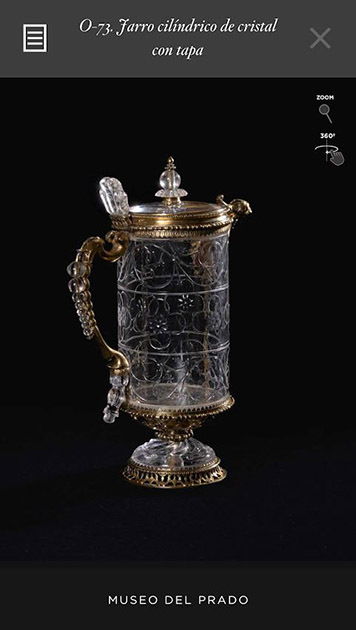 The rarity of the materials employed in conceptually complex creations of this type and the technical skill involved in their making and decoration explain why they were so highly cherished, above and beyond other works of art such as paintings or sculptures, traditionally more highly valued. This app will help you to discover the Dauphin’s Treasure, its origins, the materials used in its creation and the different workshops involved. 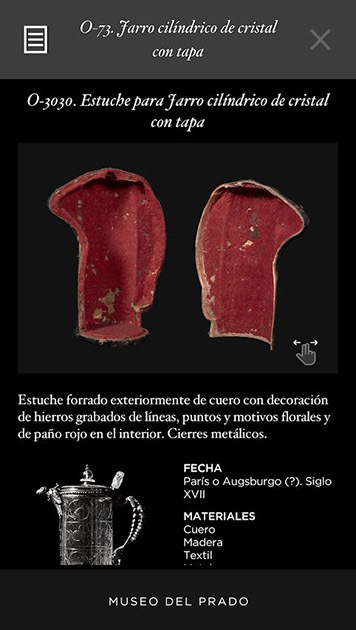 It also discusses the Treasure’s eventful history as well as the valuable cases that protected the works. This unique collection has been on display in its entirety at the Museo del Prado since 2018.